We have been informed that the M.E. debate is likely to begin between 2.00pm and 3.00pm and could last until 5.00pm on Thursday 24th January. You will be able to watch proceedings LIVE on Parliament TV. Members of the public can attend in person without the need of a ticket and watch the debate from the public gallery. 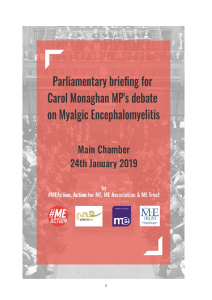 Yesterday, Carol Monaghan, MP, announced that the application she had made for a full chamber debate on the issues surrounding M.E. had been granted. The application for the backbench debate was made last October with support from Ms. Monaghan’s Parliamentary colleagues, Nicky Morgan, Kelvin Hopkins and Stephen Pound. The full debate will take place in the House of Commons next week, on Thursday, 24th January at 2.00pm. We don’t know how long the debate will take, but we expect it will be televised on Parliament TV which usually allows for debates to be downloaded. We’ve included a template email/letter below that you can amend to suit your circumstances or to raise any particular issue, and a link that will enable you to locate your MPs contact information. Try and keep your email or letter brief and to the point. You can also attach or include the Parliamentary Briefing that has been prepared by the ME Association, #MEAction, Action for M.E. and the ME Trust and is supported by other M.E. charities. Please attend the House of Commons debate on M.E. As a result of having ME I am [opportunity to briefly explain what effect M.E. has had on your life]. 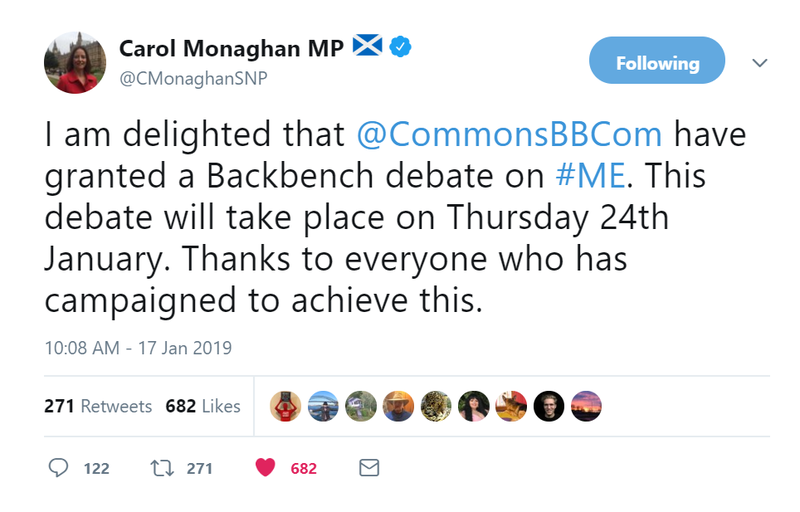 On Thursday January 24th, Carol Monaghan MP has secured a House of Commons backbench debate on M.E. – where a number of major issues and concerns will be raised. These issues and concerns are described in more detail in the attached briefing document that has been prepared and supported by national charities – who are members of Forward ME which is chaired by the Countess of Mar – who represent both children and adults with the disease. I would also draw your attention to [opportunity to raise a local issue of concern such as lack of any local specialist who can provide help with diagnosis or management etc.]. If you are able to attend this debate and raise some of these concerns I would be very grateful. Locate the contact details for your MP by visiting the Parliament directory, and then use the template above to send an email (or letter). Don’t forget to attach or include a copy of the M.E. Debate Briefing document. Please let us know on our Facebook page if you hear back from your MP and whether they will be attending the debate.